Quakertown, PA., January 10th, 2018 – The North American Deck and Railing Association (NADRA) announced the new Board of Directors, including members to the Executive Committee. Matt Breyer, Breyer Construction & Landscape, LLC was appointed as NADRA’s President & will serve for two years. Matt is an experienced remodeler and entrepreneur, Breyer has more than 15 years in the industry. Heath Bowman, Southeastern Underdeck Systems, LLC & Haven, was appointed as NADRA’s Vice President. Heath will also serve for 2 years. Bruce Verblaauw, C. Verblaauw and Sons, LLC, was elected Treasurer & will also serve two years on the Executive Committee. Kirk Hammond, Lonza, now serves as NADRA’s Immediate Past President and will remain in this position for 2 years. NADRA also welcomed three new members-at-large to its Board of Directors. Joining for a three year term are: John Keller, Sequoia Supply Co., Inc. , Gary Converse, Koppers Performance Chemicals & Vincent Carrubba, Admiral Composite Technologies, Inc. I am extremely pleased to let everyone know that the Northeast Regions Deck for a Soldier® build went very smoothly and was completed in four days. The build started on Monday, January 16th, 2017 with a crew from three separate builder member companies. We installed the Trex Elevations steel framing, along with the help from several Trex and distributor representatives. Tuesday was supposed to be a wash-out of a rainy day, but several of us gathered, installed the stairway platform and cut all of the stair stringers. Wednesday, we had crews from four builder members and we installed the decking, stairways, some fascia trim and the Andersen sliding door. We also had representatives from Fortress Railings, Fiberon, and AZEK helping out. Thursday, we had two crews, plus representatives from Trex, Wolf Home Products, Fortress Railings and Excelsior Lumber, Inc. that helped install the last of the fascia trim and the railings. We were lucky enough to have spiked the interest of a local newspaper and also the TV station News 12, New Jersey. We also received coverage from The Daily Record, you can read more & see photos / video here. Our Soldier was extremely thankful and really could not believe that a program like ours exists. He was overwhelmed when wheeled out on the deck for the first time and was able to look around his neighborhood. Kyle added: “The Deck for a Soldier® program has been top notch. Really great crew. I couldn’t even imagine something like this existed where people are just giving away decks for people but it does,” Chappell says. I would like to thank, from the bottom of my heart, everyone involved in this project for their time and materials. Many gave so freely to this project that it was inspiring to all. I continuously heard the following words, “Whatever you need for this project, just let us know”. We certainly could not have gotten this project done without the support of the best team in the decking industry. NADRA Rocks!! 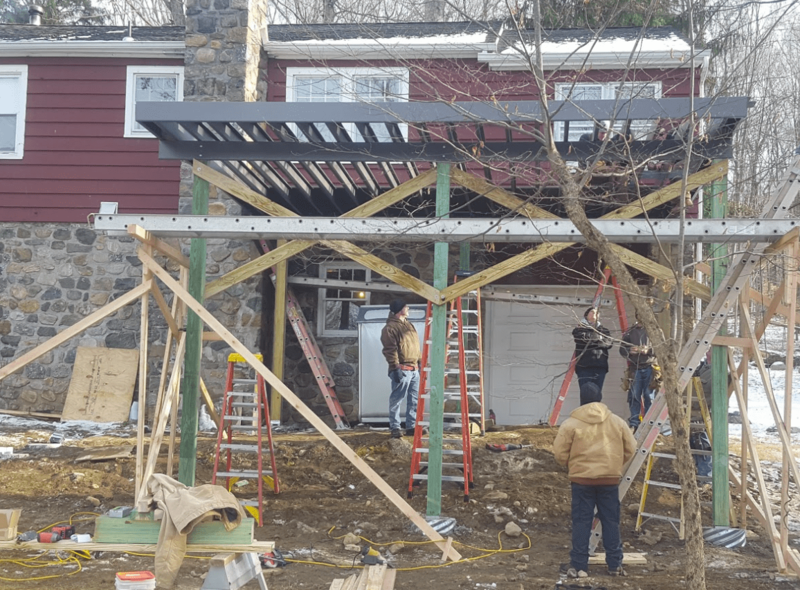 Well, everything has fallen into place and we were able to start our Deck for a Soldier® build in Boonton Twsp., NJ on January 16th! The Township has waived the permit fees except for the DCA fee. We’ve had a local builder member offer to help out and dig the footing holes on Saturday 1/7/17. We had a footing inspection on 1/11/17 and we completed the pour right after that along with the bottom of the stairway landing. We have several builders lined up to help out with this build for the four days that we anticipate the build to take, but we can always use more. If anyone else wishes to help out please go online to fill out a pledge form found here, or contact Bruce V. at BruceVerb@njdecksandrailings.com. Thanks to our awesome manufacturers, distributors and lumberyards, all of the necessary materials have been donated. Be on the lookout for pictures and more on NADRA’s Facebook page. We want to start out by wishing everyone a Happy, Healthy and Prosperous New Year!! 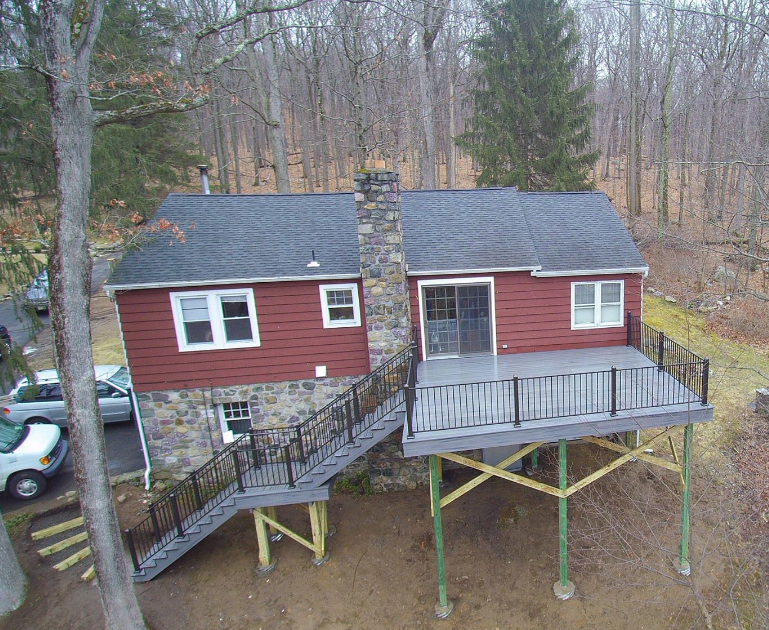 We just wanted to let everyone know that we will be starting the Deck for a Soldier® build in Boonton, NJ on January 16th, weather permitting. 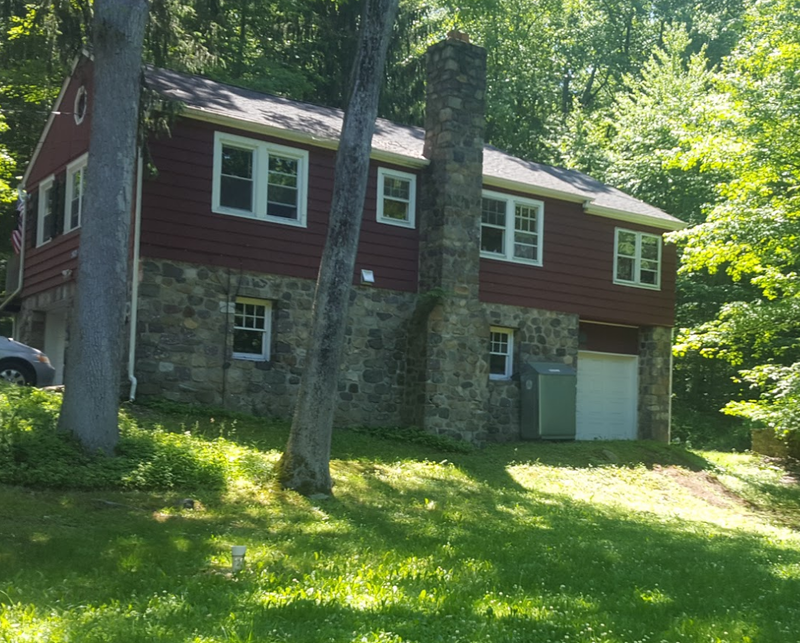 This project is located a little way off of Route 287 about 10 minutes north of Morristown, NJ. 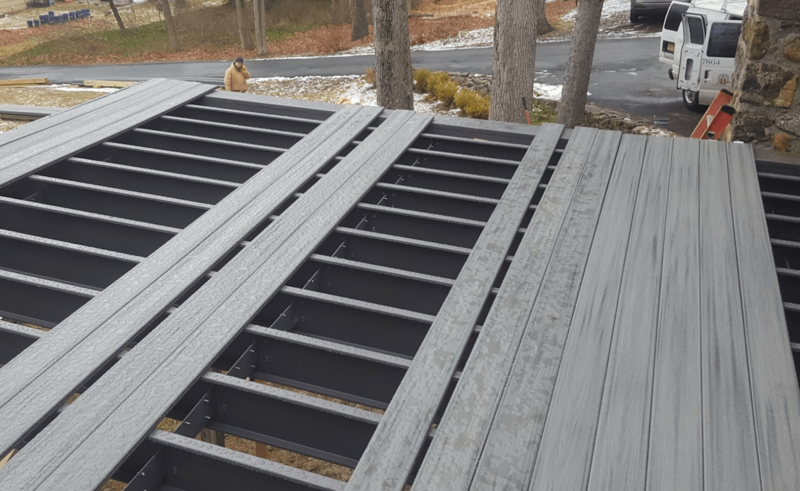 This deck will be built using Trex Elevations Steel Framing, so if any of you would like to learn some of the ins and outs of working with this product, please let us know so we can schedule you to volunteer to frame. Of course we will need help for about 4 days in order to complete this build and help tying up loose end to finish is always needed. If you have already filled out a labor pledge, please let us know what day(s) that week work best for you or your crew. We are also hoping to dig and pour the 10 footings required for this deck either late next week or very early the following week so that the concrete has time to cure before we start building. We would appreciate if we could get a few guys to help dig these footings. We have some builders but can still use a few more to step up and help out with this build. If you are interested in helping and have not notified us or completed an online labor pledge, please email us or click on this link. We will try to keep a steady flow of help on the project so that we do not have too many workers on any given day. Thanks to all of our manufacturers, distributors and lumberyards, all of the materials have been accounted for. The one thing that has not been supplied yet is a Porta-John. As we hear back from each of you, we will put together a schedule that best fits the needs of the build and will be back in touch with you soon. With the holidays just around the corner it is the time of year to think about giving in the old fashioned tradition for the holidays, donating to a great local cause and giving back to the community where we make our living. 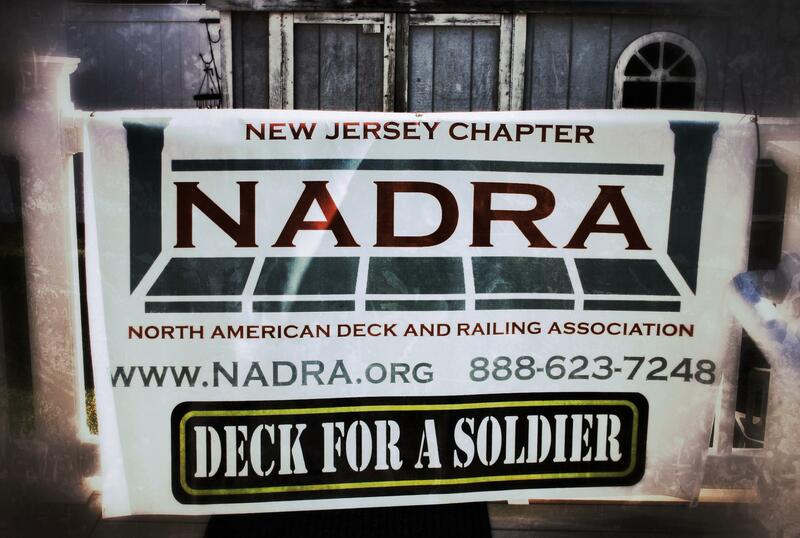 The NADRA Deck for a Soldier® program is about to kick off it’s Northeastern build on 1/16/17, weather permitting. We are planning to get a start right after the first of the year and install the footings prior to this build date. We have almost all of the materials accounted for except for some concrete form tubes, a Porta-John, and some small hardware. If anyone can help us with these last few things it would be greatly appreciated. Lastly, we can still use a few more builders to step up and help out with the build. If anyone can donate time to help out on this project please contact us at bruceverb@njdecksandrailings.com. You can fill out the online form to make your pledge of material, labor or even a monetary pledge for various unexpected expenses right here. We will start to send out emails in order to figure out who can help on which day in the near future. This will keep a steady flow to the project and keep from having too many workers on any given day. 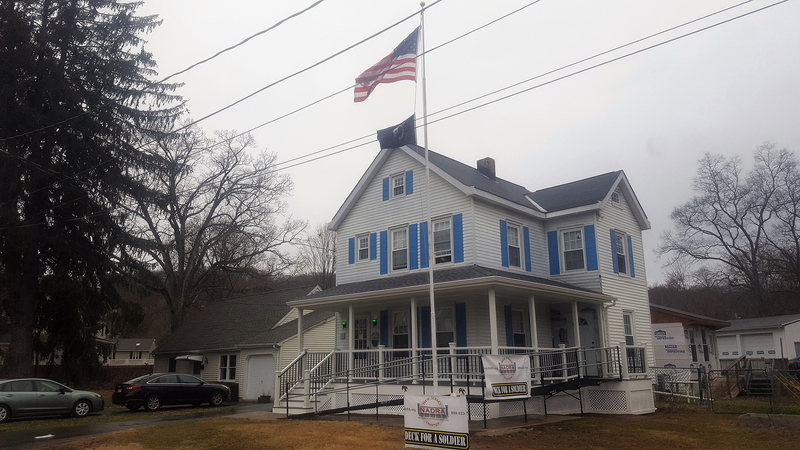 With the thoughts of this past Memorial Day still fresh in our minds, and what it stands for, the NJ D4S Committee would like to call our chapter to action for the 2013 Deck For a Soldier project slated for early this fall , with a ribbon cutting scheduled for Veterans Day, 11,11,13. We are asking for volunteers of skilled workers from our Builder members, and just as importantly, donations of materials from our Supplier and Manufacturer Members. This is a great opportunity for everyone involved to say thank you to our Armed forces who keep our country safe day in and day out, and who put our freedom above their own safety. 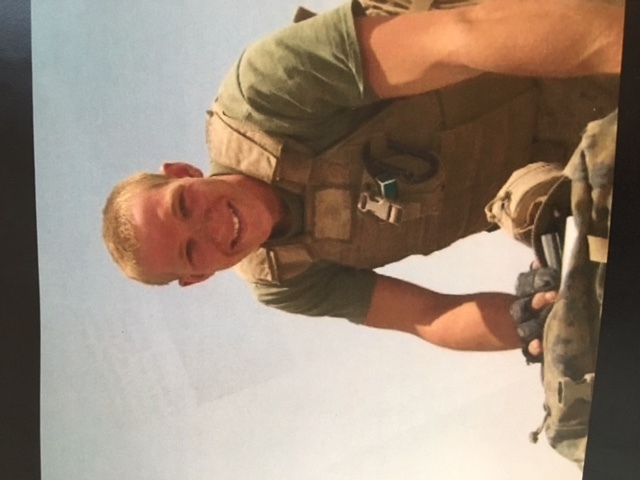 The local soldier is Sean O’Connor from Brick, NJ. He served 20 years in the Marines and Army National Guard. He did 3 combat tours and is now retired. He was in Desert Storm and retired as a Sergeant First Class with many metals of honor. He was also an instructor at Fort Dix. For all Volunteers and Material Donations, please contact NADRA Headquarters at Info@NADRA.org or 215-679-4884. YOU MUST BR A CURRENT NADRA MEMBER TO DONATE OR PARTICIPATE. Headquarters will then pass the information on to the D4S committee. A very deserving Thank You needs to be said to our Committee Chair Gustavo delaCruz of Barrett Outdoors and Robert Lascelle of My Deck, for their many hours of time already spent getting this project up and running for our chapter! !